Government stake in IDBI Bank may fall below 50%, RBI Act to be amended to form monetary policy committee. Unveiling the plan, Finance Minister Arun Jaitley said PSU banks will get the infusion crore next fiscal. The government announced a host of measures Monday to salvage the public sector banks, including a Rs 25,000 crore bailout in the form of recapitalisation, but experts said this infusion may not be enough to bail out the PSU banks roiled by soaring non-performing assets (NPAs) and losses. Unveiling the plan, Finance Minister Arun Jaitley said PSU banks will get the infusion crore next fiscal. The government is also planning to bring down its stake in IDBI Bank — which made a loss of Rs 2,184 crore in the third quarter — to below 50%, he said while presenting Budget 2016-17. Of the allocated Rs 25,000 crore in fiscal 2016, only Rs 5,000 crore remains to be infused. Experts said the government has announced barely 10 per cent of the capital requirement in the changed circumstances. 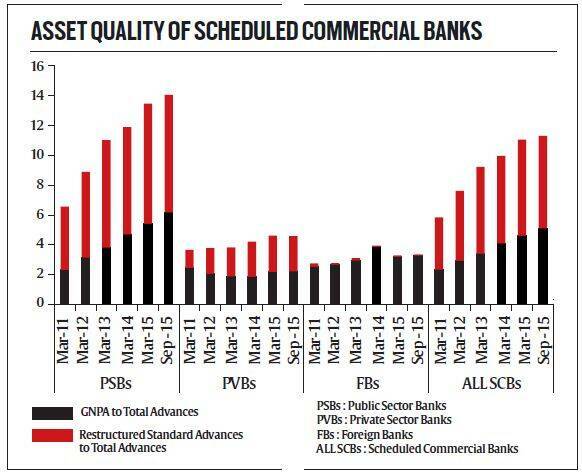 “Inadequate capital allocation for PSU banks at Rs 25,000 crore… Our estimate including Basel needs and assuming a 12% growth is a capital requirement of Rs 2,50,000 crore,” said Abizer Diwanji, partner & national leader — Financial Services, Ernst & Young. On the issue of stressed assets of PSU banks, Jaitley said, “It’s a legacy from the past. Several steps have already been taken in this regard. We are not interfering in lending and personnel matters of the banks. Structural issues have been addressed in various sectors like power, coal, highways, sugar and steel.” Gross non-performing assets are expected to jump 31.48 per cent in the fiscal ending March 2016 to Rs 4,26,400 crore from Rs 3,24,300 crore. On top of this, banks are expected to show restructured loans worth Rs 615,000 crore for the year ending March 2016, says India Rating. According to a senior banker, the government is testing the waters with its stake dilution plan in IDBI Bank where it currently holds over 80%. Minister of State for Finance Jayant Sinha had earlier indicated it was planning to do an Axis Bank-like transformation with IDBI Bank. The government has already named former comptroller and auditor general Vinod Rai as the chairman of BBB which will advise on senior appointments in PSU banks. Jaitley announced more measures for speedier resolution of stressed assets. He said the Debt Recovery Tribunals will be strengthened with focus on improving infrastructure, including computerised processing of court cases, to support reduction in the number of hearings and faster disposal of cases. He also proposed a comprehensive Code on Resolution of Financial Firms to provide a mechanism to deal with bankruptcy situations in banks, insurance companies and financial sector entities. This code together with the Insolvency and Bankruptcy Code 2015, when enacted, will provide a comprehensive resolution mechanism for the economy. Other steps include amendment of RBI Act to provide statutory basis for a monetary policy framework and a Monetary Policy Committee through the Finance Bill 2016. The RBI has already agreed to set up the committee to decide on the policy. However, Jaitley did not spell out details of the proposed committee, especially if the RBI governor will have a casting vote. Among other measures, he proposed a comprehensive central legislation to deal with illicit deposit taking schemes and a Financial Data Management Centre under the aegis of Financial Stability Development Council to facilitate integrated data aggregation and analysis in the financial sector. The government will also undertake a massive rollout of ATMs in post offices over the next three years.